"We're not vegan, but we love to make vegan pancakes because it cuts down on calories, fat, and unnecessary chemicals." Blend flour, apples, almond milk, coconut oil, water, baking powder, cane sugar, nutmeg, and cinnamon in a blender until smooth. Heat a non-stick griddle over medium-high heat. 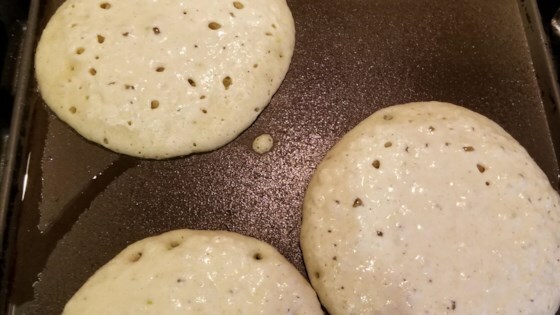 Drop batter by large spoonfuls onto the griddle and cook until bubbles form and the edges are dry, 3 to 4 minutes. Flip and cook until browned on the other side, 2 to 3 minutes. Repeat with remaining batter.